SAN ANTONIO, 2017-Aug-07 — /Travel PR News/ — Humana Rock ‘n’ Roll San Antonio Marathon & ½ Marathon today (August 02, 2017) announced a revamped marathon and half marathon course for the 2017 event. The course changes were made to accommodate downtown construction while still running past San Antonio’s iconic sites such as The Alamo, the San Fernando Cathedral and Mission Concepción. San Antonio’s premier running festival returns the weekend of December 2-3, 2017. Sunday’s marathon and half marathon will now start at Presa and Market; which while still downtown allows for easier access and is closer to the finish line and post-race festival. The first few miles of the course have been updated to give the runners an upgraded downtown experience with even more stunning views – such as the addition of Travis Park – and additional Riverwalk crossings. The courses will travel together before splitting at mile 12 with the second half of the marathon route following the same as 2016. Runners will once again experience the historic and scenic sights of San Antonio including, the Alamo, San Fernando Cathedral, University of Texas San Antonio downtown campus, Brackenridge Park, The Pearl and an epic finish at Hemisfair Park. In true Rock ‘n’ Roll fashion, live bands, enthusiastic cheerleaders and spectators will line the race route, concluding with a celebratory finish line festival and post race Toyota Rock ‘n’ Roll Concert Series with headliner Vintage Trouble. Check out the all new course map online. The 2016 Humana Rock ‘n’ Roll San Antonio Marathon & 1/2 Marathon generated a total economic impact of over $32,388,703 for the local economy, according to an economic impact study conducted by the San Diego State University Sports MBA program. The report showed that the event filled 20,561 hotel room nights, producing $1,648,037 in tax revenue and other tourism-related fees collected by local government. The race attracted 24,000 registrants from 50 states and 19 countries throughout race weekend. The event will once again feature two-days of running with the marathon, half-marathon on Sunday and the 5K and 10K on Saturday. Participants can automatically qualify for the “Remix Challenge” by running the 10K on Saturday and any distance on Sunday and earn the coveted Remix Challenge medal in addition to each race’s finisher medals. The 5K and 10K races on Cherry St. at the Alamodome and finishes on Alamo Plaza. Race weekend kicks off with a free Health & Fitness Expo, where runners can find the latest in running technologies, fitness apparel, health and nutrition information and interactive displays. The Expo takes place at The Henry B. Gonzalez Convention Center on Friday, December 1 from 12:00 p.m. to 7:00 p.m. and Saturday, December 2 from 9:00 a.m. to 5:00 p.m. The Expo is free and open to the public. For more information about Humana Rock ‘n’ Roll San Antonio or to register for the event, please visit RunRocknRoll.com/San-Antonio. The 10th annual Humana Rock ‘n’ Roll San Antonio Marathon & ½ Marathon will return the weekend of December 2-3, 2017. Live bands, cheerleaders and spectators will entertain participants along the scenic course, which starts on Presa St and Market St and finishes near Hemisfair Park and La Villita. The race concludes with a finish line festival and post race concert. Runners who complete any distance on Saturday and any distance on Sunday will earn a special Remix Challenge medal in addition to each race’s finisher medals. A two-day Health & Fitness Expo kicks off race weekend at The Henry B. Gonzalez Convention Center on Friday, December 1 and Saturday, December 2. The free Expo is open to the public and will feature the latest in running apparel and nutrition products. 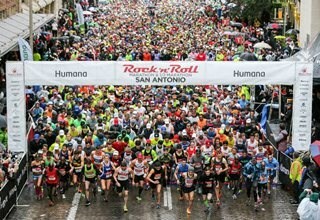 For more information about Humana Rock ‘n’ Roll San Antonio, please visit RunRocknRoll.com/San-Antonio or follow on Twitter @runrocknroll. This entry was posted in Business, Festivals and Events, Travel, Travel Management, Travelers and tagged 2017 event, Cory Michel, half marathon course, Humana Rock ‘n’ Roll San Antonio, Marathon. Bookmark the permalink.